Dental implants are ideal solutions when replacing missing or damaged teeth. In this article we look at a case of a patient who had an impacted lower premolar tooth. 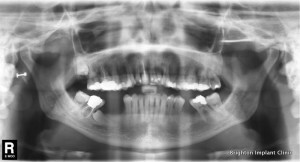 The patient presented to our clinic complaining of multiple missing teeth on the lower right side. The missing teeth were affecting her bite and facial appearance as they had been missing for some time. During the initial examination we noted that there was an impacted premolar tooth lying horizontally. The position of this tooth meant that dental implants could not be placed in a normal vertical position as the tooth was in the way. 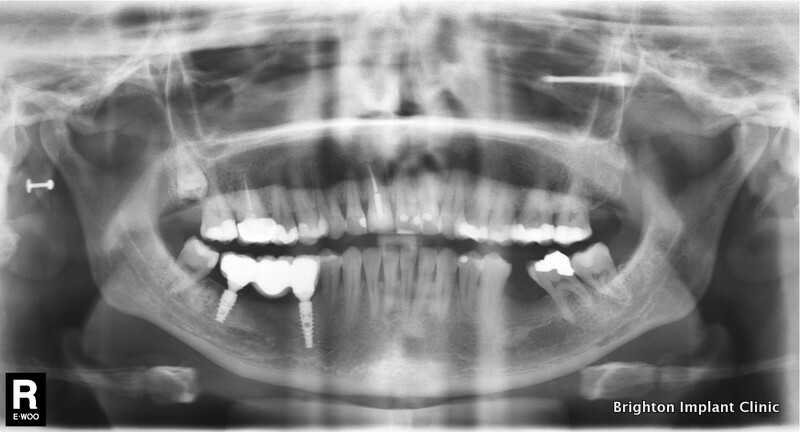 In addition to this the patient complained about discomfort when eating and drinking with a lower right back molar. The radiographs confirmed that the second last molar had a failed root canal treatment. It was decided with the patient that dental implants was the best solution to replace the missing teeth. The first phase of treatment meant that we had to remove the problem teeth, both the molar and the impacted premolar. 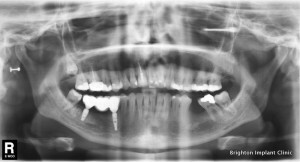 This treatment was carried out under sedation. After a four month healing period the patient returned to the clinic for a re-assessment. At this stage a CT scan was taken in order to assess the type and volume of bone available for dental implants to be placed. Dental implants are an ideal solution. 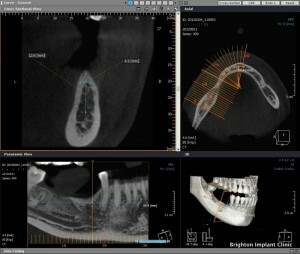 Two dental implants were placed in order to support a 3 unit fixed bridge. The bridge was made with a screw access design in order to facilitate easy removal ( should any problems arise that require easy removal of the bridge ) Total treatment time was 13 months. Brighton implant clinic provides dental implants treatment at each of its 3 branches in Brighton, Hove and Hailsham. For more information on impacted teeth and dental implant treatment please feel free to Contact Brighton Implant Clinic.